Sal Monella reports on rumors that Trump’s silence on Russian cyber attacks on our country is a contest to out silence the poignant six-minute-twenty-second symbolic pause of Parkland Florida shooting survive made activist Emma Gonzalez. Fox so-called News is seen in its grotesque light of truth as completely hypocritical. J.R. Sears shares the 10 Commandments of being an atheist, followed by two, new editions of words of wisdom from Swami Salami. 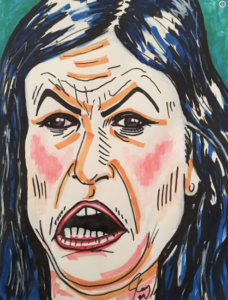 The New Yorker’s satirist Borrowitz lectures a crowd on the politics of elitism preluding host Thomas Savino’s take down of the hideous public liar Sarah Huckabee Sanders. The Daily Show’s Desi Lydic amplifies Savino’s veritas with her own satire in “Let Me Huckabee.” Finally, host TJ gloats in his New York Yankees’ opening day win over SRN One’s Toronto Blue Jay, until Trumpire Gorsuch make the calls behind the partisan plate at the Dems’ and Republicans’ opening day of Major League Raceball. Baseballbernie sanderscheatingchris christieChuck ShumercorruptionDemocratseliteElizabeth Warrenentertainmentgrotesquehypocrisyin whine the truthJudge Neil GorsuchlegislationlyingMitch McConnellNancy PelosinewsOpening Daypodcastpoliticsrepublicanssal monellaSarah Huckabee Sanderssatiresavinosavino veritasSupreme Courtted cruzThom Savinotj savinotrumpveritasWashington D.C.